Whenever possible, I buy refurbished PCs rather than new ones-- and it's what I recommend to all my friends. Unfortunately, the word "refurbished" is loaded with bad connotations -- used, damaged, unreliable -- that can make items so labeled unattractive to many buyers. But it's my experience that at least with personal computers, refurbished often means better than new, because retailers or manufacturers are selling something at a loss they never want to see again. Returned once is one time too many. Twice or thrice is simply unacceptable. I got my first tip off about the benefits of refurbished in the late 1990s when visiting a Sony repair store then located in Beltsville, Md. I observed a number of PCs and asked about them. One of the clerks explained that the shop was one of just a couple clearinghouses refurbishing Sony PCs. I expressed my disbelief in refurbished as being any good. But he explained that Sony didn't want to ever see the PCs again. His job was to make sure the refurbished PCs left in perfect working order. The reasoning made sense. The refurbished PC has passed the burn through period. Whatever went wrong has gone wrong and been fixed. There is even less risk of problems with a rightly refurbished PC than a new one. It made enough sense to me that I bought my first refurb -- a dual-processor Dell workstation -- in 1998, saving about 40 percent off the cost of a new model. In February 1999, I bought a refurbished PowerBook G3 from PC Connection. The retailer made a mistake, that, thankfully, it didn't want to fix. I purchased a 233MHz model but received instead the 266MHz PowerBook. In 2001, I sold both computers, which ran flawlessly until retirement (PowerBook) and theft (Dell workstation). Since, I've mostly purchased refurbished PCs. I first wrote about buying refurbished in November 2000 for CNET News.com. But some reasons for choosing refurbished have changed in a decade. Windows PC prices have fallen such that the biggest benefit -- good performance for lowest cost -- doesn't matter as much. That 20-30 percent savings off a $400 PC doesn't have the oomph as a $1,500 computer back when averaging selling prices were so much higher. There is benefit, just elsewhere -- allowing the user to get more of something else -- such as faster processor, higher-resolution display or perhaps a thinner, lighter laptop for same price (or less) as a heavier model. Still, as my Dell example will show, even for cheaper Windows PCs savings can be meaningful. However, refurbished offers potentially more benefits for Macs because they cost so much more than do PCs. The cheapest Mac you can buy costs $999 -- that's the entry price to join the elite club. Refurbished can shave 10 percent to 30 percent off the price. What Kinds of Deals are There? Buying refurbished means understanding important nuances that generally only Dell makes clear. First: there is refurbished by the store and refurbished by the manufacturer. I generally recommend against store-refurbished models. I have little confidence in the quality control of back-room store technicians, which sentiment retailers justify by practice: most in-store refurbs come with limited warranty, typically from 30 days to 90 days. If retailers don't have enough confidence to back the refurbished PC with a real warranty -- without trying to get you to pay more for extended coverage -- you shouldn't believe in them either. By the way, PCs sold at retailers like Fry's Electronics in boxes stamped "refurbished" typically come from the manufacturer, but you should still check the warranty. Manufacturer-refurbished PCs are more likely to come with the same warranty as new. Apple and Dell are good examples. The OEM wouldn't do this without having some confidence the refurb is at least as good as new, if not better. Whenever possible, I buy refurbs from the manufacturer. However, I have no problem purchasing from retailers that sell "factory refreshed" computers. Contrary to popular convention, not all refurbs are returns and many were in fine working condition when sent back to the retailer or manufacturer (often not for problems but simply for buyer's remorse). Some PCs sold as refurbs never left the factory, which is often the case with configure-to-order models. Someone cancels the order, and the manufacturer is stuck selling the new PC as refurbished. By the way, these models aren't necessarily better than new. They are new, with hefty discounts. Most manufacturers offering direct refurbs do so through an online outlet store. Dell offers the best classification, labeling outlet PCs "refurbished," "previously ordered new" or "scratch and dent." One refurbished Inspiron 14R -- 2.4GHz Intel Core i5 processor with 3MB cache; 14-inch WLED display; 4GB DDR3 memory; Intel integrated graphics; 500GB hard drive; and Windows 7 Professional -- sells for $599. Dell's main website offers the same model for $699.99 after an instant discount from $883.99. 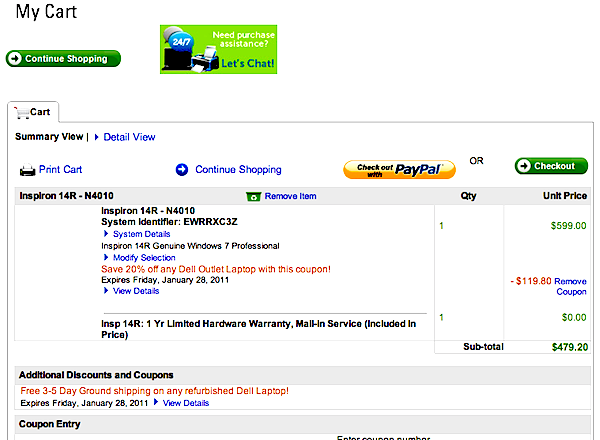 However, Dell's outlet store is currently running a 20 percent discount via coupon code. Entering the code during checkout reduces the refurbished 14R price to $479.20 with free shipping. That's more than 30 percent savings. Dell's outlet store is by far the best organized among major manufacturers. But deals can be found elsewhere for people willing to dig. Most other OEM outlet stores also carry overstocks, which are new and not usually discounted as heavily as refurbs. Sony deals tend to be on older models, which often vary just slightly from newer ones. For example, one VAIO A390 CTO laptop -- 2.4GHz Intel Core i3 processor; 14-inch display with 1366 x 768 resolution; 4GB DDR3 memory; 512MB ATI Mobility Radeon HD 5470 graphics; 500GB hard drive; Blu-ray player; and Windows 7 Professional -- sells for $869.95. A new A490 model, identically configured but with 2.53GHz processor, costs $969.99. This kind of discount is typical. While there are occasional "steals" from Sony, generally savings are not as good as many other manufacturers' outlet deals. So what about Apple? The Mac maker labels its deals as either "refurbished" or "clearance." Assessing deals can be tricky because of subtle changes occurring from model to model. One 13-inch MacBook Pro -- 2.4GHz Intel Core 2 Duo processor with 1066MHz frontside bus; 13.3-inch display with 1280 x 800 resolution; 4GB DDR memory; 256MB nVidia GeForce 320M graphics; 250GB hard drive; and Mac OS X 10.6 -- for $999, or $200 off a new model. Savings on the 2.53GHz 15-inch MacBook Pro is 15 percent -- $1699 refurbished versus $1999 new. I discovered all these deals on the afternoon of Jan. 23, 2011. There are also retailers that sell or specialize in refurbished PCs, such as Acer Outlet out of United Kingdom. I'm not familiar enough with the store to vouch for it. 1. "Open Box" is not the same as "refurbished." I never buy open box items and discourage everyone else from doing so. Open box is a total "buyer beware" situation. You don't know with whom that PC slept, so to speak, and probably don't want to know. Warranties are typically negligible, from none to as much as three months. Open box items often are missing something, and I've seen few deals that warrant the risk. 2. Check to see if the product was refurbished or is new (e.g., cancelled order or overstock). You should know exactly what you're buying and from that assess how good are the savings. Generally speaking, refurbs should cost less than overstocks or cancelled orders. But don't complain if a manufacturer offers a deeper discount on a new system. 3. When buying from a store, find out where that refurb came from. Was it returned to the store and refreshed, or did it come refurbished from the manufacturer? Again, I recommend sticking with manufacturer refurbs. 4. Warranty should be the same for refurbished models as new ones. If not, particularly if 30-90 days compared to 12 months, buy from somebody else. If the manufacturer won't back the PC like it's new, the refurb isn't as good as new. 5. There should be comparable return policy. Any refurb sold "as is" with no returns isn't worth your money. Make sure the store's return policy for refurbs is same as new. While I contend that refurbs are as good as, or even better than, new, some PCs were bad from the start and aren't getting better. The manufacturer doesn't really want to sell a lemon, and you most certainly shouldn't buy it.